TIS is open access and available to all scholars worldwide. You retain copyright of your own paper, and can circulate it as much as you like, but please ensure that you cite its publication in TIS, with the appropriate page numbers for your own contribution. If you publish a version in a more specialist publications, please make a statement along the lines that: This is a revised/expanded version of a paper first published in TIS Vol. 1 (Dec. 2015) [page nos.] under the title ‘...’.TIS is open access and available to all scholars worldwide. There are two technical issues which we would like to bring to your attention: (1) During the conversion to PDF format, the hyperlinks on the cover and TOC lost track of their bookmarks (to content within the document) but we will be correcting this early in the New Year. (2) The DOI [Digital Object Identifier] for each paper, the number registered with CrossRef which gives it a permanent searchable identity on the website, will also be in place in January. We will advise you of your own DOI as soon as they arrive from CrossRef, and will ensure that they are posted in an updated PDF file of Volume 1. In conjunction with its 25th anniversary, National Coalition of Independent Scholars (NCIS) is presenting Traditions & Transitions: Independent Scholars and the Digital Landscape, scheduled for June 18-21, 2015, at Yale University in New Haven. Traditions & Transitions, the 16th NCIS conference, aims to celebrate independent scholarship and to explore and critique digital humanities praxis and tools for research, publishing, and sharing scholarship. The Call for Papers is included below. Mona Berman, President National Coalition of Independent Scholars, has put out a call for papers (see below).Additionally NCIS will soon be putting out a call for panels about the Digital Landscape and how it impacts independent scholarship. That will be followed by a call for workshops that will ask for submittals that deal with helping us indies use the various digital tools now available - this can be career oriented specifically or more generally cover topics such as how to publish in ejournals, blogs, etc. One needn't be an NCIS member to present a panel or workshop. We are making every effort to stream as much of the conference as possible, so if you have the tools, it might be possible (no promises yet) for some of your members to present papers, etc. via video feed... If that's something in which you and ISAA have interest, let me know and we can begin exploring that more thoroughly. We are all very excited to have ISAA affiliated with NCIS. Let's hope we can make this as meaningful a relationship as possible! NCIS an international organization dedicated to advancing independent scholarship through access to research facilities, grants, and professional support since 1989. In conjunction with its 25th anniversary, National Coalition of Independent Scholars (NCIS) is presenting “Traditions & Transitions: Independent Scholars and the Digital Landscape,” scheduled for June 18-21, 2015, at Yale University in New Haven. Traditions & Transitions, the 16th NCIS conference, aims to celebrate independent scholarship and to explore and critique digital humanities praxis and tools for research, publishing, and sharing scholarship. Keynote speaker Lawrence K. Grossman, Vice Chair and co-founder of the National Center for Research in Advanced Information and Digital Technologies’ “Digital Promise” campaign, will address the conference. Conference coordinators are now accepting proposals for original papers from any discipline in the humanities and sciences that fall within the broadly defined theme of traditions and transitions. Selected papers will be organized into panels by conference coordinators. Proposals for themed panels of three or more speakers are also being accepted. For more information on the conference, visit ncis.org/conference. 1.Full name, telephone number, and email address. Include your first and last name in the subject line of all email correspondence with the conference coordinators. If you are submitting a panel proposal, include each speaker’s name and contact information. 2.A 200 to 250-word abstract. In the event that your paper is selected, the abstract will appear in the conference program and on the NCIS website. Proposals for panels must include a panel abstract as well as the abstract for each speaker’s presentation. Abstracts are reviewed blind. Do not include your name or contact information on your abstract. 3.A brief biography (50-100 words). 5.Notice of any technical requirements for your presentation, such as A/V or IT equipment. 1. Each paper will be peer reviewed by a panel of independent scholars drawn from members of NCIS and its affiliate groups. Those serving on the peer review panel are not eligible to submit papers. 2. All presenters must be NCIS members in good standing. Non-members are invited to submit papers for the conference, but in the event that the paper is accepted, the author is required to join NCIS upon notice of acceptance. 3. No member may present more than one paper. 4. Presentations must be in English. Authors of accepted papers will be required to submit their full paper to the conference coordinators for final review by February 15, 2015. Email conference@ncis.org. Individual papers will be organized into panels, with each presentation lasting 15-20 minutes. We are also open to diverse presentation formats, including lightning rounds, panels, and workshops. Portions of the conference may be streamed live online via video, twitter, and/or blogs. Please email any questions you may have about the upcoming conference to conference@ncis.org. 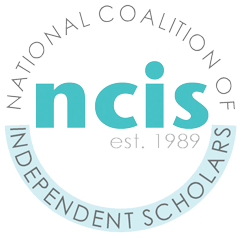 NCIS is a US-based 501(c)(3) nonprofit corporation founded in 1989 with the mission of supporting the work of independent scholars and making independent scholarship available to the public. NCIS represents independent scholars from all disciplines, including unaffiliated scholars, adjunct and part-time faculty, research professionals, artists, and curators. The organization’s primary functions include working to improve access to research libraries; encouraging foundations and institutes to open competitions to independent scholars and to include them on review committees; serving as fiscal sponsor for grants; providing information about grants, fellowships and publishing; bringing independent scholars together on the basis of needs and scholarly interests; and facilitating the creation of local organizations of independent scholars and assisting existing local groups. Although NCIS is based in the United States, the organization's members and mission extend internationally. The organization sponsors H-Scholar (https://networks.h-net.org/h-scholar), an H-Net (www.h-net.org) online forum for scholarly discussion. NCIS recognizes regional and international affiliate members and is itself an affiliate of the American Historical Association. Affiliate members support the overall purpose of NCIS and meet membership criteria but establish their own membership qualifications and dues and manage their organizations independently of NCIS. Visit http://ncis.org/2015-ncis-conference to read more about the conference. To learn more about NCIS, visit http://www.ncis.org.